"It's by the grace of God that I'm alive at all", states iconic vocalist Bobby Liebling during the 10-minute interview segment of "When the Screams Come", the first DVD in PENTAGRAM's storied 40-year history. Clean, sober, and sincerely grateful for the fans that kept believing and the loved ones that helped put him on the straight and narrow, Liebling's 2010 performance at Maryland Deathfest VIII is one that shines with purpose and unparalleled charisma, perhaps more so than at any other time in the man's long, tumultuous career. PENTAGRAM is one of the most important "cult" bands of our time, rivaled only by the likes of the VELVET UNDERGROUND for a track record of album sales that is dwarfed by the number of musicians inspired to start a band upon hearing them. Watching Liebling, bassist Greg Turley, drummer Gary Isom, and ultimate PENTAGRAM guitarist Victor Griffin (PLACE OF SKULLS) shake the earth to its core during this 12-song set of heavy doom metal classics, one understands why in crystal clear terms. BLACK SABBATH with a '70s hard rock songwriting sensibility is the proud basis of these tracks and few groups — its Birmingham brethren among them — are able to create such a sonically dense, overwhelming experience with vocals, drums, guitar, and bass. Griffin's guitar tone alone could raise the National Terrorism Advisory Level. 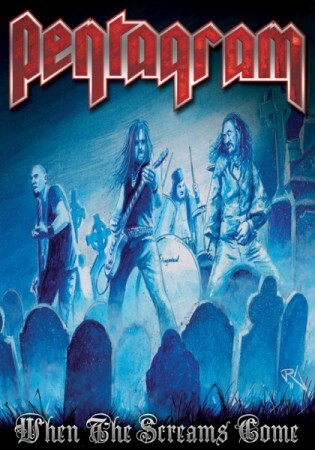 "Forever my Queen" may be the quintessential cut, but it is the mammoth grooves of a song like "Sign of the Wolf" or the match of Griffin's fiery and soulful solos with that spine-tingling bass line of "When the Screams Come" that defines the raw power and organic flow of the PENTAGRAM sound. The orgasmic moments are many; one example Griffin's solo during "Ask No More", which serves as the bridge to that soulful up-tempo fire ritual. The chemistry, the songwriting, the vintage hard rock vibes, and the sheer weight of the damn thing are what make this PENTAGRAM performance the stuff of our-of-body experiences. This is a whole different kind of heavy, one that transcends modern conceptions of the word. Breaking it down into the simplest of terms, if the warm, earth rumbling tones and doom swing of the first three BLACK SABBATH albums still makes the hairs on the back of your neck straighten and snap off, then you need to hear/watch "When the Screams Come". As Liebling notes about his lyrics in that same interview, "my own words have really been warnings that you have to make a choice in your life." Based on the content of this DVD, it is clear that he made the right one.